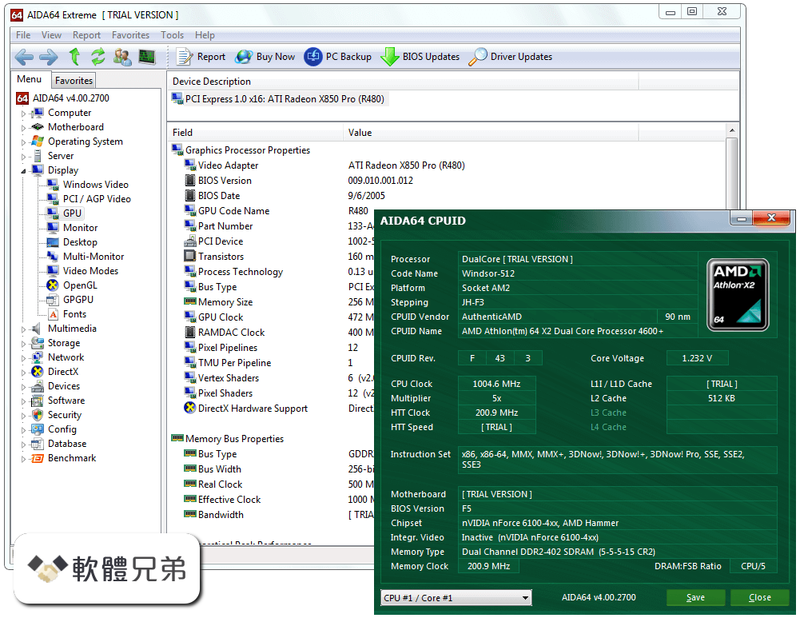 AIDA64 Extreme 擁有無與倫比的硬件檢測引擎。它提供了有關已安裝軟件的詳細信息，並提供診斷功能和超頻支持。由於它實時監測傳感器，它可以收集準確的電壓，溫度和風扇速度讀數，而其診斷功能有助於檢測和防止硬件問題。它還提供了幾個測量單個硬件組件或整個系統性能的基準。它與所有 32 位和 64 位 Windows 版本兼容，包括 Windows 8.1 和 Windows Server 2012 R2. AIDA64 提供超過 50 頁的硬件配置信息和超過 50 頁的安裝程序，軟件許可證，安全應用程序和 Windows 設置. AIDA64 系統穩定性測試使用 64 位多線程壓力測試模塊將計算機驅動到其絕對限制。還提供硬盤，SSD 和 OpenCL GPGPU 視頻適配器壓力測試. 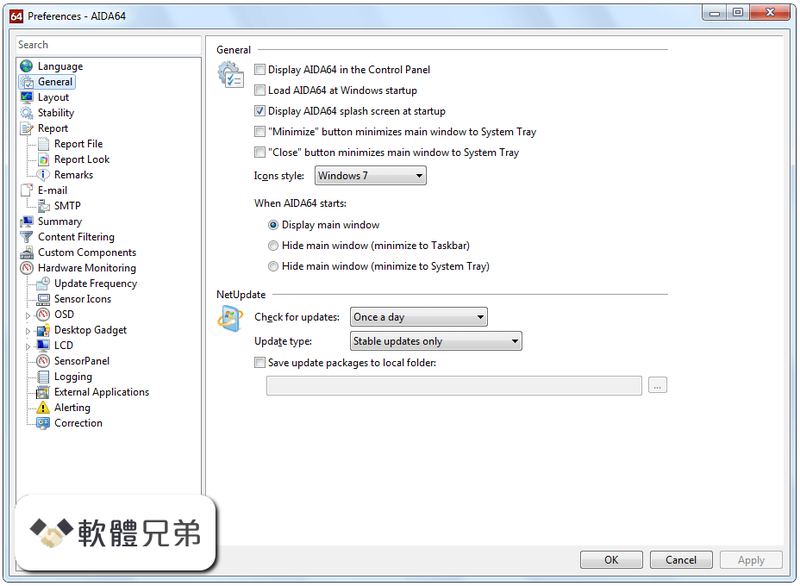 AIDA64 提供了超過 50 頁有關已安裝程序，軟件許可證，安全應用程序和 Windows 設置的信息。已啟動的進程，服務，DLL 文件，啟動程序和已訪問網頁的列表也可用. AIDA64 可以在連接到計算機的各種 LCD / VFD 設備上顯示重要的系統數據。最新的 AIDA64 版本支持超過 50 個 LCD 和 VFD 屏幕，並且引入了對智能手機和平板電腦上傳感器值的無線遠程監控. AIDA64 支持 250 多種傳感器設備來測量溫度，電壓，風扇速度和功耗。測量值可以顯示在系統托盤圖標，OSD 面板，桌面小工具，羅技 G15 / G19 遊戲鍵盤液晶顯示器和 Razer SwitchBlade LCD. 注：免費試用 30 天試用，功能有限。您還可以下載 AIDA64 商業版，中小型企業管理解決方案. 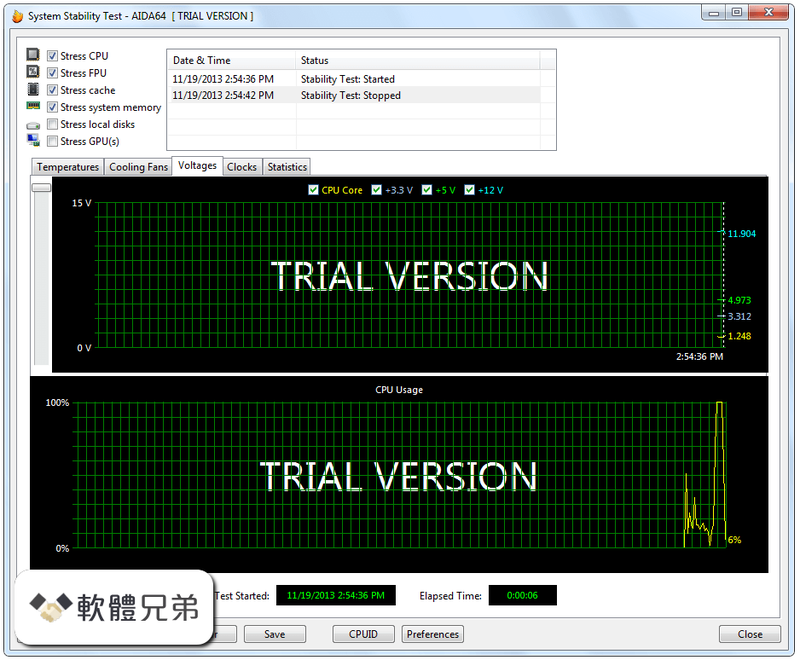 AIDA64 Extreme is an industry-leading system information tool, loved by PC ... and 64-bit Windows editions, including Windows 10 and Windows Server 2016. 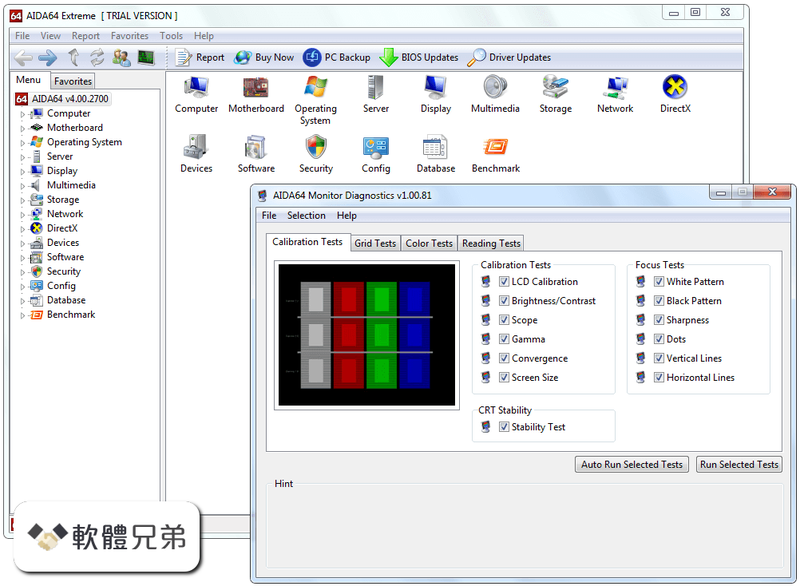 AIDA64 Extreme has a hardware detection engine unrivaled in its class. ... FinalWire Ltd - 15.5MB (Trial Version). Version: 4.50.3025 Beta.